Virginia State Police were on the scene of a multi-vehicle accident involving a car carrier and another vehicle in York County at Camp Perry Thursday afternoon just before rush hour, causing a messy commute. According to state police, the car carrier came apart and struck an overhead sign and a pole at Camp Perry. I found several reports of this accident and none of them reported the condition of either driver involved. From the looks of the truck in the picture it’s bad. UPDATE: 11-10-09 comment from a reliable source: “I know the company owning this truck, and to correct the record, the truck had a steering tire blowout, and only this truck was involved. The SUV beside the truck was off the headrack. Further the driver was not injured.” A “st eering tire blowout” makes sense to me instead of the statement that “the car carrier came apart”. Somewhere between the state police and the reporter a tire comming apart became a carrier coming apart! Best part is no injuries. The suv beside the truck apparently was sill on the headrack at point of impact. Check out the pole imprint on it. This entry was posted in Auto Transport and tagged accident, wreck. Bookmark the permalink. I know the company owning this truck, and to correct the record, the truck had a steering tire blowout, and only this truck was involved. The SUV beside the truck was off the headrack. Further the driver was not injured. 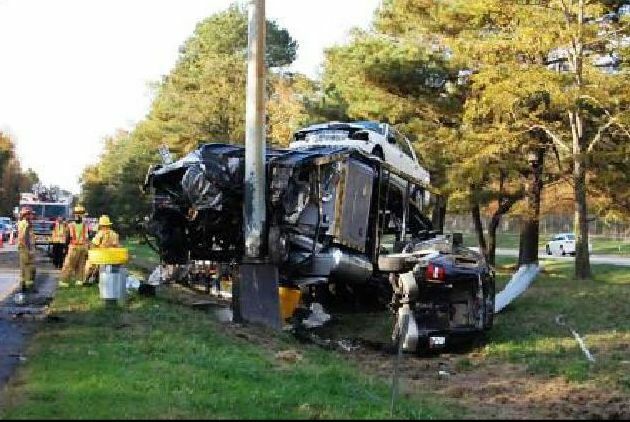 whats up with all these scab carhaulers crashing?